Basic facilities like eternal traffic congestion, drainage issues and rowdy menace are rampant in this locality. 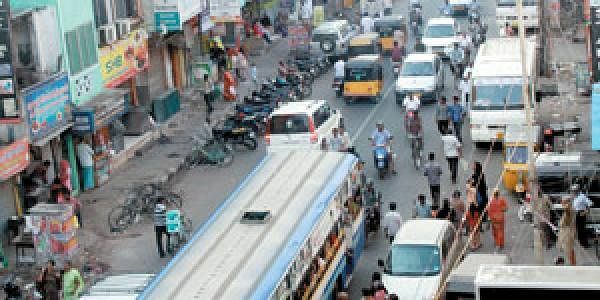 CHENNAI: The residents of the Chepauk-Triplicane constituency, who have elected DMK candidate J Anbazhagan in the recently concluded assembly election, hope that he would put an end to the eternal traffic congestion, drainage issues and rowdy menace that are rampant in the locality. One of the oldest residential localities in the city, also popularly known as ‘bachelor’s paradise’ due to the abundant presence of messes and mansions, Triplicane seems to have been stuck in a time warp. While several other parts of Chennai have witnessed civic and infrastructural improvement, this locality has been denied such facilities. Though commercial establishments, particularly the mansions and hotels, have mushroomed in the locality in large numbers in the past ten years, the other related infrastructure facilities remain archaic. “Most of the roads in the constituency remain to be narrow, causing bottlenecks and major traffic congestions. During peak hours, it will take nearly one hour to get out of this area,” said Pandian, a businessman from Triplicane. “For instance, the footpaths of Dr Besant Road, Triplicane High Road and Zam Bazaar were fully encroached by roadside eateries and fruit vendors, causing traffic congestion throughout the day in the area,” said Murugan of Triplicane High Road. He further added that trucks that come to unload goods occupy most of the carriageway and the traffic police often look the other way. “Though the government has constructed separate shops for roadside vendors near the TN Cooperative Bank, no efforts were made to shift them to the new place,” complain a group of residents of Ayya Pallai street. On the other hand, the residents were worried about the frequent overflow of the sewage in the area. “The drainage system is very old, and doesn’t have the capacity to drain the sewage let out by commercial establishments, which causes it to often overflow,” said Mani, a resident of Chepauk. The other serious problem is the menace from local rowdies. “If a resident attempts to build a new house or modify it, immediately, the local Councillors would ask for a bribe. If we dare to question him, he will create problems to stop our construction work,” said a 45-year-old resident (on request of anonymity). The residents also complained about the gathering of anti-social elements near the MRTS railway station, who run prostitution rackets, sell ganja and misbehave with girls coming in and out of the station. “There is no light at the station entrance. Local politicians have made illegal constructions near the station and run prostitution rackets,” claim a group of residents. The residents also complained about the rising crime incidents, like chain-snatching, across the locality and cattle menace near the Parthasarathy temple.